George and Betty have been married 28 years and have had a roller coaster marriage. Even though they did not get married under the best of circumstances, they felt compelled to stay married because they saw the pain that divorce played on families. They both desired more from their marriage but didn’t know where to go or what to do. And, they rarely talked about their marriage. Betty read relationship and counseling books and sought advice from friends. George pressed on and poured himself more and more into work, trying to provide a more comfortable life through material wealth. They lived in the same house, sometimes ate together, slept in the same bed, but rarely communicated. Intimacy for him was physical and for her emotional. Neither felt their needs were being met or that their relationship was anything but daily life struggles sometimes experienced together. Many marriage counselors, books, and programs out there will encourage you to identify the problems in your marriage, seeing where misunderstandings lead to miscommunication which leads to more and more distance. 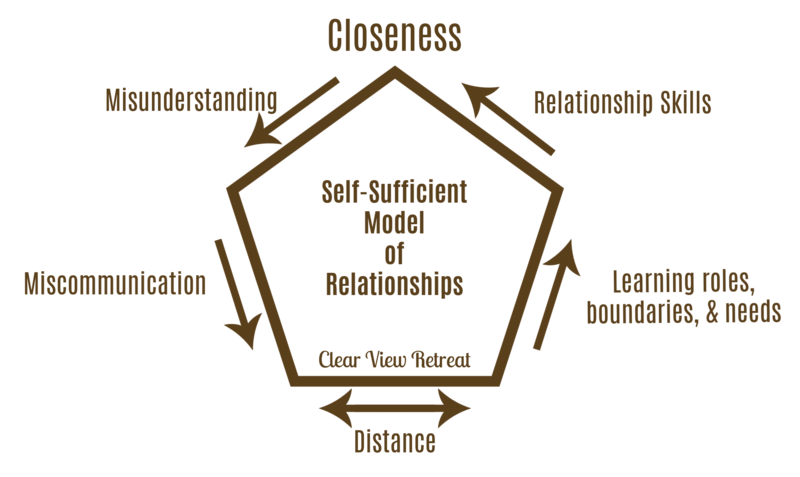 Their solution is to teach you proper roles, boundaries, and needs as well as communication and other relational skills in order to try to build more and more closeness. Unfortunately, however, that model is quite a self-sufficient, behavior modification type view. Now, we don’t throw the baby out with the bathwater. Those concepts are important in understanding our roles, personal boundaries, and needs as well as how to communicate all of those to our spouses, and the Bible teaches many great things about our roles and responsibilities in marriage. Learning skills and concepts can take a dysfunctional marriage and help it become more functional. What do those skills and concepts do for our hearts attitude? How do those skills impact intentional intimacy? Does cooperation elude you in your marriage? If being completely honest, would you describe your marriage as hell? Maybe, you have learned cooperation and would say you are satisfied but worn out and going through the motions? Notice the parable describes two places BUT NEITHER MENTION THE PRESENCE OF GOD. Cooperation and good works will not get us into heaven (that would be another MANY blog posts unto itself) AND without Him, we cannot live the abundant earthly life He desires for us, no matter our health, financial, or familial circumstances. In marriage, there is more than surviving – simply continuing to exist, as the inhabitants of “hell” in the parable experienced until they couldn’t hang on any more and starved to death. There is more than striving – making great efforts to continue, as the inhabitants of “heaven” in the parable experienced. God is bigger than just relational skills and cooperation. He is grace, mercy, and unconditional love. He desires and designed true intimacy with Himself as the foundation for our relationships. We try to capture this in our logo. It is triangular as an illustration that two people are never closer to one another than when they draw closer to the Lord. Who is your closest neighbor? A hint: If you are married, it is not the person living in the house next door. Of course, there will be many opportunities to shine God’s love outside of the marriage relationship, and that is a great topic for future blogs. But, the answer and your closest neighbor is your spouse. What if we were as selfish towards them as we are selfish? Could we really pour out ourselves as much as we pour into ourselves? The story of the Good Samaritan is great illustration of selflessness, even to the point of going beyond simply helping someone. That story is from Luke chapter 10 and is where Jesus asks “who proved to be a neighbor to the man?” One of the most amazing things from the story is that it wasn’t from whom we expected. Religious leaders walked right by an injured man, but a Samaritan, who was seen as despised and rejected, showed mercy towards the man. Jesus says, “Go and do the same.” Do the same to your neighbor which means… do the same for your spouse. As the husband or wife draws closer to the Lord, the distance between the two shortens. Even if one moves more than the other, the distance still shrinks because God’s love changes hearts. “The unbelieving husband is sanctified through his wife, and the unbelieving wife is sanctified through her husband…” (1 Corinthians 7:14) If you find yourself in this circumstance of drawing close to the Lord but your spouse is not, take heart. It is not an easy ministry to have, but it is one that can glorify God through obedience and submission to the heart of God. Through their 28 years together, George and Betty both moved into a relationship with the Lord through Jesus Christ. They began to change, slowly yet steadily towards God, often with one of them closer to the Lord than the other. Although Betty really had felt like giving up and that God was not in their marriage, she continued to pray and seek the Lord’s wisdom. George began to take notice of Betty’s emotional needs (he got her ring fixed – something that mattered monumentally to her that he had ignored for years!!) and realized that there was more than providing financially for his marriage to have a more fulfilling marriage. He started seeking Betty’s opinion about family situations that he thought he had all figured out and agreed to seek counseling. There were many things this couple needed to learn about relationships and each other, but they stayed on the journey together. In their marriage mentoring, they learned that in the biblical view of intentional intimacy we must accurately identify the cause of problems: an unbelieving heart (though not necessarily an unbelief in God Himself) which leads us into selfishness and consumer-focused relating which in turn causes conflict. The cure for the cause is repentance and renewal as one or both spouses turns their heart back to worshipping the one true God. As you repent and are renewed by God, you can choose, with God’s help, to be others-centered. Choosing to think of your spouse’s needs is to choose to come to terms with your own limitations and to see that God has something better for you both. There is more than surviving and striving in marriage. There IS thriving in marriage. With God, He moves you from a place of cooperation and a place of just roles, boundaries, needs, and skills to a place of intentional intimacy, using those roles, boundaries, needs, and skills to honor and glorify Him, letting Him become your satisfaction, thus easing your burden and your spouses’. It can and will become a joy to be with each other, a blessing to call each other your own. Please join us next week as we explore how to let God do that in your marriage. The decisions you make today are either carried or projected into tomorrow and beyond. No greater decision can be made than that which is Jesus Christ. Build on that.